In an interview with Awami Awaz editor, Dr Jabbar Khattak, the author discusses why Pakistan has come to a turning point where it has to choose to revise its policies or face total alienation in the international community. 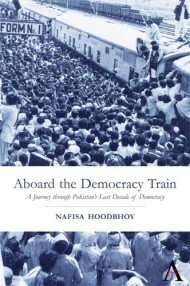 During the wide ranging interview on foreign policy, Nafisa Hoodbhoy speaks about how the Trump administration views Pakistan on account of the perceived role it has played vis-i-vis Afghanistan and how changing alliances in the Middle East are shrinking options for the country. The candid hour long interview centers around a US motion to put Pakistan on the Financial Action Task Force list by June 2018, of nations that engage in money laundering and support terror outfits. It advocates how the improvement of relations with neighboring countries could have a salutary effect on governance inside the nation as well. The expanded edition of her book is also discussed during the interview.